City and Juventus Agrees a Deal For Tevez. 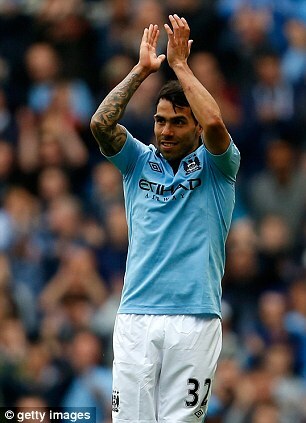 Serie A champions Juventus have agreed a deal for Manchester City’s Argentina international Carlos Tevez. According to Sky Sports the agreement was reached when officials from both clubs met in London on Tuesday and Tevez, 29, will travel to Italy today(Wednesday) for a medical and to discuss personal terms with the Turin based club. Juventus have reportedly offered the player with a distinctive burn scar down his neck a three-year contract and are set to pay a flat fee of around £10m with some add-ons also agreed on subsequent basis. Before making his mark on the English Premier League (EPL), the former Manchester United forward made his debut for Boca Juniors at the age of 16, later traveling to Brazil to play for Corinthians in 2005. On 23 August, 2006, Sky Sports reported that Tevez was refusing to play for Corinthians. Tevez later confirmed that he and Javier Mascherano were signing for relegation threatened West Ham United on permanent deals for undisclosed fees. After helping the Hammers regain their top flight status, he joined United in a loan deal worth £20m, subjected to an appeal from West Ham. The deal came with its own controversy but it sizzled out and United finally approved a two-year loan deal for the striker on 10 August, 2007. Two years later, he became the first player to move between the two rival Manchester clubs, signing a five-year contract with City for a fee claimed to worth £47m, a British transfer record, but was later denied by the club and Media Sports Investment– the company which owned the player’s rights. He has since made 148 appearances and scored 74 goals for the blue half of Manchester, albeit he was fined and suspended by City following his infamous Champions League stand down at the Alianz Arena in Munich in 2011. With only Sergio Aguero and Edin Dzeko left for new manager, Manuel Pellegrini, for next season, City will now search for a replacement- although Napoli’s Edinson Cavani is reportedly an overpriced option for Tevez. Do Arsenal need a new striker?